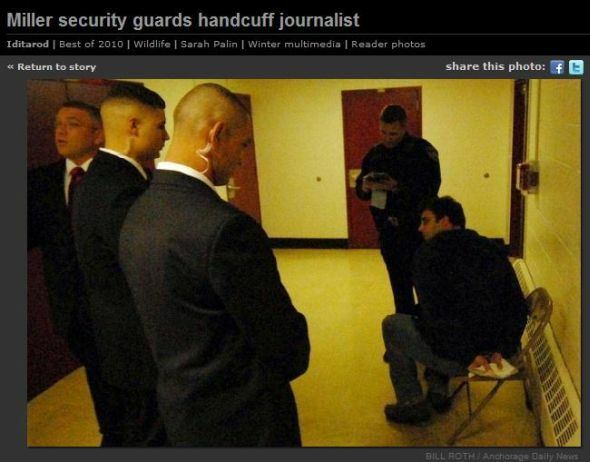 That was an iconic image that emerged from Alaska in the form of a blurry snapshot that captured local online journalist Tony Hopfinger slumped in a chair in the hallway of an Anchorage middle school, with his hands cuffed behind his back. Detained by private security forces hired by Republican candidate, and Tea Party favorite, Joe Miller, Hopfinger was "arrested" after he tried to ask questions to the notoriously press-shy candidate following his appearance at a public forum. The image captured not only so much of the current, at-times hay-wired Tea Party campaign season, but also the deep-seated resentment and outright hatred the conservative movement feels for the press. (aka The "lamestream media.") The image also captured a rare opportunity for conservatives to put those feelings into action by cheering the "arrest" of a citizen journalist. And trust me, the GOP Noise Machine was thrilled by the news of Hopfinger's handcuffing and detainment. Members loved the idea of finally putting reporters in their place. So no matter what happens on Nov. 2, for me the surreal image of a stunned Hopfinger handcuffed and guarded by Miller's security team, charged essentially with asking the candidate too many questions, is the one that's gong to stay with me long after the campaign season is over. The only real question is, will the image have the same lasting impression on the press corps, which still seems to be blissfully unaware of the dangerous warfare that's being waged against it by the Tea Party movement. Please tell me that reporters and pundits realize that it's not a coincidence that it's been high-profile Tea Party candidates like Sarah Palin, Sharron Angle and Christine O'Donnell who have famously shunned the press and refused to answer reporters' questions on behalf of voters. Please tell me Beltway media elites aren't oblivious to the fact that undermining the free press in this country remains a central, unshakable tenet of the Tea Party movement. I don't know how many times that painfully obvious declaration has to be delivered before political journalists get the message and begin to understand the extraordinary political push that's afoot to completely delegitimize what they do in this country. Incredibly, I think lots of pundits and reporters are still brushing off the open, anti-media warfare that's been raging as just more of the same. Y'know, it's just conservative activists complaining about press coverage in hopes of getting friendly treatment in the future. Sorry folks, but we left the working-the-refs realm a long, long time ago. The Tea Party movement, and the press-hating frenzy that's helping to fuel the uprising, doesn't want better political coverage. It wants no political press coverage. It wants the Fourth Estate destroyed. And it wants its movement leaders not to be held accountable. In order to achieve that open playing field, journalists and the idea of journalism has to be completely vilified so right-wing supporters no longer even see the pursuit as a legitimate one. So Tea Party media leaders cheer when reporters are handcuffed and subject to phony citizen "arrests," and unleash lots of other vile attacks, portraying them as unpatriotic and treasonous. Two quick examples. First, remember how Andrew Breitbart, who can barely keep his spittle in check when denouncing the press, addressed the media-mad attendees at CPAC last winter? Kate Zernike of the New York Times, are you in the room? Are you in the room? You're despicable. You're a despicable human being. And the news media's response to Breitbart and his kind of vicious press attacks? Writers from glossy magazines queue up to interview Breitbart and to announce how charming he is in person. Um, okay but he still denigrates journalists as enemies of the state. And he still publishes a site that posts a cavalcade of false, name-calling assaults on journalists. But apparently media elites are willing to look past that because Breitbart really is fun to have drinks with.